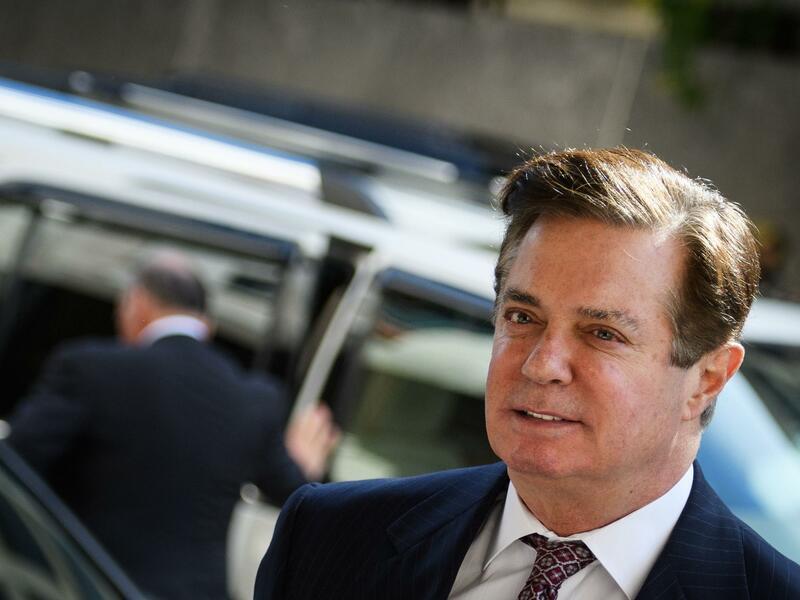 Paul Manafort arrived for a hearing at U.S. District Court on June 15 in Washington, D.C.
Manafort is scheduled to appear in federal court in Washington, D.C., on Friday morning in a hearing that had been moved from earlier in the week. Negotiations have been underway between his lawyers and the office of Justice Department special counsel Robert Mueller. Manafort's D.C. case includes charges of alleged conspiracy, failing to register as a foreign agent and witness tampering. He already faces about 10 years in prison after having been convicted in a separate case last month in the Eastern District of Virginia on bank and tax fraud charges. Manafort hasn't been sentenced since his Virginia verdict, but the prospect of that prison time and more punishment in the District of Columbia case may have prompted him and his lawyers to seek to avoid the second trial. If a plea is concluded on Friday, it also might keep nitty-gritty details out of the public eye involving Manafort's lobbying activities in Ukraine on behalf of Viktor Yanukovich, the former president who was ousted in popular protests. What isn't clear is whether Manafort would accept a deal in which he receives leniency in exchange for cooperation. His onetime business partner and protégé, Rick Gates, made such a deal and appeared as the government's star witness against Manafort in his Virginia trial last month. If Manafort simply pleads guilty and makes clear that he hasn't given evidence to the government, that could increase his favor with President Trump, who already has faulted what he calls Manafort's "unfair" treatment by the Justice Department. Trump discussed a possible pardon for Manafort with his lawyers earlier this summer, attorney Rudy Giuliani has told NPR. But Giuliani says Trump has agreed not to move forward with the idea. Former Trump campaign chairman Paul Manafort appears close to reaching a plea deal with special counsel Robert Mueller's office. If they do reach an agreement, then Manafort would be able to avert a second trial scheduled to begin next week here in Washington. NPR justice reporter Ryan Lucas is here to tell us more. Hi, Ryan. SHAPIRO: What charges does Manafort face in this second trial scheduled to start next week? LUCAS: Well, these are related to allegations of illegal foreign lobbying work that he did on behalf of Ukraine. There are a number of charges in this case, but some of the most interesting are conspiracy to defraud the United States, which is kind of an umbrella charge. Then you have failing to register as a foreign agent - that ties directly into the lobbying work that he did on behalf of Ukraine in the United States - making false statements to investigators and then a charge that actually came up in - earlier this year of witness tampering and conspiracy to tamper with witnesses, where the government alleges that he was trying to provoke witnesses in the case to provide false testimony to investigators. SHAPIRO: And what do you know about this possible plea deal? LUCAS: There's not a lot that we do know at this point in time. The details are all very sketchy. We know that they have been talking about a possible agreement for some time. There were whispers about a possible deal even as far back as in the kind of waning days of his first trial in Virginia. The idea is that you would avoid trial. But to do so, you have to plead guilty. We don't know at this point whether there would be cooperation required of Manafort, which of course is a key question here. People want to know whether he would cooperate with investigators, with special counsel Robert Mueller in this of course big, ongoing investigation into Russian interference. SHAPIRO: And that first trial in Virginia ended with his being convicted on some eight counts or so. LUCAS: He was convicted on eight of 18 counts, and that of course was on bank tax fraud charges, yes. SHAPIRO: And so what happens next? He's scheduled to appear in court tomorrow. LUCAS: He's scheduled to appear in court tomorrow. It was originally scheduled for 9 a.m. It was pushed back to 11 a.m. by Judge Amy Berman Jackson. If there is a plea agreement, if something has indeed been reached, Manafort will be in court himself tomorrow. He would have to stand up an indeed plead guilty to the judge, say that he was guilty of these acts that he is pleading to. Now, that would be a big step here because Manafort has already been convicted, as we've said. But this would add to the list of people that special counsel Robert Mueller has been able to move forward with. There's of course the guilty plea of Michael Flynn, the first national security adviser for the president. Then you have George Papadopoulos, the aide - the foreign policy aide during the campaign. And then of course there's Rick Gates, who was Manafort's deputy during the campaign and a longtime business partner. SHAPIRO: Now, you said we don't know whether a guilty plea would include cooperation with Mueller's office, but what does this mean writ large for the special counsel's investigation into Russia and the Trump campaign? LUCAS: Well, this would just - you know, we already have this conviction of Manafort, so this doesn't drastically change the outlook for the investigation itself. But it certainly would provide a boost of sorts. Of course the investigation has been under attack from the president and his allies. The president likes to say that this is a witch hunt. So if you can nail down Manafort again on these charges, get him to plead guilty, that is in a sense a notch in the belt for Mueller. But again, this is, you know, just another step forward in this long, ongoing investigation that - you know, we'll see where it lands. SHAPIRO: NPR justice reporter Ryan Lucas - thanks, Ryan.